Some interpret this meaning as the joining of mind and body, while others, like Kathy Phillips’ class at be. Women’s Health & Wellness, take it a step further. This February, the ladies who fill Kathy’s Tuesday and Thursday Gentle Yoga class, decided to take it upon themselves to give back to the community. 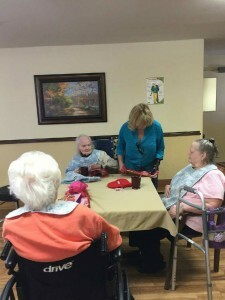 Between understanding laughs when someone stepped out of Warrior Three or as they rolled mats up at the end of class and chatted about where to grab lunch, the idea to adopt the seniors at Countryside Nursing and Rehabilitation Center in Pilot Point, Texas, was formed. On the Friday before Valentine’s Day, the yoga class packed their cars with 95 care packages filled with candy, puzzles, vintage Valentines, and more that they’d purchased and assembled themselves, and drove up to Countryside. Much to the delight of residents, class members also came with plenty of hugs and laughter. The class will be back at Countryside throughout the year to bring gifts and hugs to the residents, with a focus on Easter and other holidays. Kathy’s Gentle Yoga class is offered on Tuesdays and Thursdays at 12:00 noon as part of the extensive yoga, Zumba, and meditation class schedule at be. Women’s Health & Wellness.